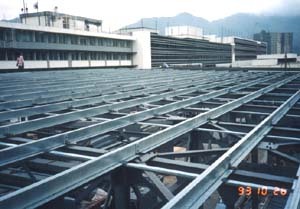 High tensile galvanized steel purlin is cold roll-formed from hot dipped zinc coated high strength steel strip which has minimum yield stress of 450 Mpa. The standard galvanize coating is 275 g/m2 (Z275, 9 mm) to BS 2989 on both sides. Heavier galvanize coating mass of 450 g/m2 (Z450) is also available upon request. Three thicknesses are available, ie 1.6, 2.0 and 2.5 mm. Two basic cold formed section C & Z are available. 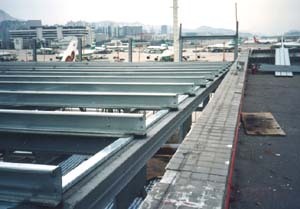 Generally C sections are used for simple span construction with the purlin butted at internal support (Figure 2). Zed section with broad and one narrow flange are designed to nest neatly and are intended for lapping at internal support (Figure 3). Structural continuity results in improved rigidity but lapping also doubles the thickness of purlin over supports where bending moments are greatest.